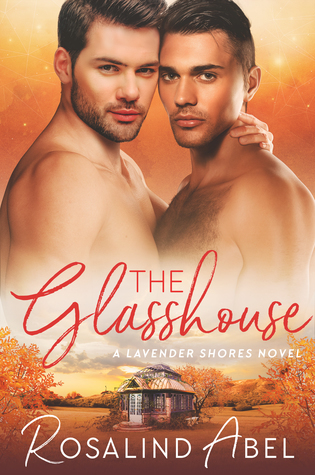 The Glasshouse Review ~ The best in the series … 10 out of 10! Cover Art: Two men, heads together looking outwards, shirtless, set against an orange background above a scene of a glasshouse and surrounding fields. The title separates the two pictures and is in an deep orange script with the author’s name in a white upper case across the bottom. The scenes fit the storyline. Synopsis: Accurately sets the scene for the story. I would have liked to have seen a warning of adult content. Plot: Harrison Getty is getting ready for his wedding which is to be screened on TV. In a moment of blind panic he kisses one of his groomsmen and jilts his husband-to-be at the altar to run off together. The groomsman in question just happens to be Adrian Rivera who has always had a crush on Harrison and just knows he is ‘the one’ which explains why he has a reputation around Lavender Shores for not sticking with relationships. Is he about to get a taste of his own medicine? Main Characters: Harrison Getty, former NFL quarterback, Gay heartthrob and now TV reality star. Has commitment issues. Adrian Rivera, farmer and partner in an organic veg shop. Had commitment issues until Harrison. Secondary Characters: Will Epstein, the jilted groom plus his family and many characters from previous books in the series make an appearance. Flow/Continuity: The story flows effortlessly from scene to scene. No continuity errors were found in my review copy. Conflict & Climax: The conflict stems from Adrian’s reputation and the fact that he allows it to be believed he encouraged Harrison to jilt Will, taking the blame on himself. He has been in love with Harrison for a long time. The climax builds from Harrison’s inability to commit and the damage caused because everyone blames Adrian for Harrison’s actions. Writing Style: Written in the first person from alternating points of view. Editing/Formatting: Very tidy. The formatting is neat, each chapter begins on a new page with large font headings, giving which character’s perspective and the timeline. Price: In line with the other books in the series and reasonable for the length of story. Conclusion: This has got to be the best book of the series. It has shades of the film ‘The Runaway Bride’ in that Harrison is unable to commit, backing out of his wedding and the televising of the event then in his relationship with Adrian. You are kept wondering right until the end whether Adrian will be jilted just like Will and more to the point, how does Harrison like his eggs? This is another 10* read for me. Previous Men of Hidden Creek Reviews ~ Incredibly well thought stories … Perfect 10 score! Next Consorting with Dragons Review ~ Interesting … 9 out of 10!